Tested in many countries & found it really works! as it is sweetened with 3 calorie sucralose. Mild orange flavour. To put all of the above 4,700mg into a capsule will need 10 capsules! Just put 1 sachet of Collasamine powder in a glass, add water and enjoy with your morning breakfast or lunch or anytime of the day. Tastes like orange juice. 1. Glucosamine – actual, elemental -1500mg. From corn. Not crab shells. 2. Chondroitin 500mg - from Chicken cartilage , not beef cartilage like in all other brands. 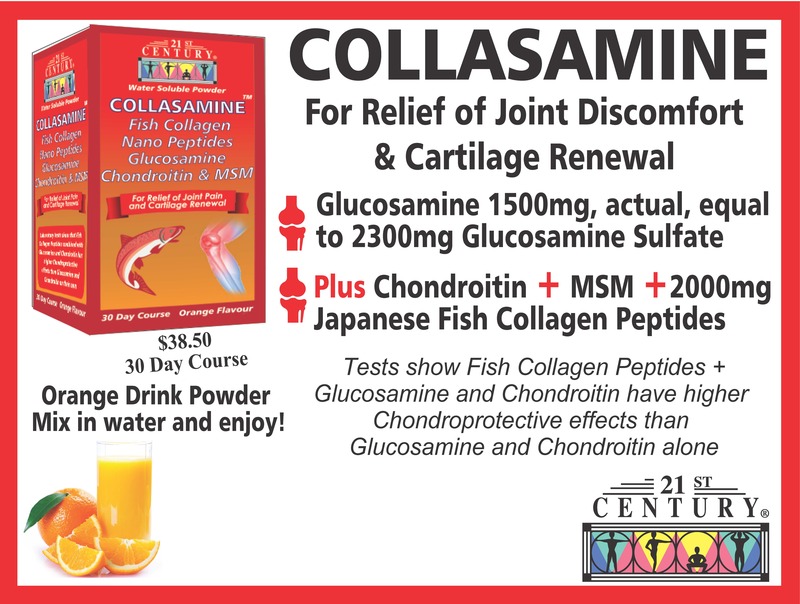 A new addition to the joint pain medicine chest – Fish Collagen Nano Peptides. This is made in Hokkaido, Japan/ produced to the highest quality and to a nano size of less than 3,000 Daltons. The smaller the better absorbed it will be. Goes easily right to your joints to build collagen – right where it is needed. Tested to be free from Radiation, Dioxins, PCB's, Mercury, Lead as well as free from E.Coli, Salmonella and all other types of microbes. Certified Clean and Healthy. Why did we combine Fish Collagen nano Peptides with the other ingredients? Because tests done on lab rabbits show that rabbits which had osteoarthritis induced into them (strange but true that this can be done and was done) and then were given Glucosamine only did not have as much improvement as the rabbits which were given Glucosamine plus Fish Collagen Peptides combination. This combination showed it had much superior results than just Glucosamine alone. In addition, we have put in Chondroitin and MSM (which the rabbits did not get)– just to be sure that you get everything that is considered to be beneficial for joint inflammation and pain. One sachet a day is all you need. Used in hospitals and clinics - combining Glucosamine with Fish Peptides for better and quicker relief - and for more permanent pain relief and cartilage renewal. Get yourself younger joints and cartilage now! Only $38.50 for a 30 sachet course to keep your pain and swelling away with a delicious orange drink daily. No swallowing tablets which stick in your gullet - just a delicious orange drink - mix powder in water and enjoy! I suffer from bad knee pain. Doctors tried prescription drugs which did not help much. I tried all sorts of Glucosamine tablets which did not help reduce my pain. I tried Collasamine as a last resort before going for knee replacement surgery. After the first month, I could feel the improvement. Now after 3 months I can bend down like a young man, to pick up the newspaper which the news vendor throws on the porch floor in my house without any walking stick. I can get up from a chair or toilet without any pain. I can walk long distances comfortably. I am 78 years old. I have been suffering from arthritis pain for the past 10 years. My son gave me a bottle of Collasamine. After 2 months, I felt less pain and more flexibility. Now after 4 months I am almost pain free and can move around without any help even in winter when my pain used to be at the maximum. I tried all sorts of drugs and Glucosamine tablets to reduce my joint pain. Nothing worked. Doctors said I had worn out cartilage in my knees as I was a long distance runner all my life till I could not run or even walk anymore without pain. 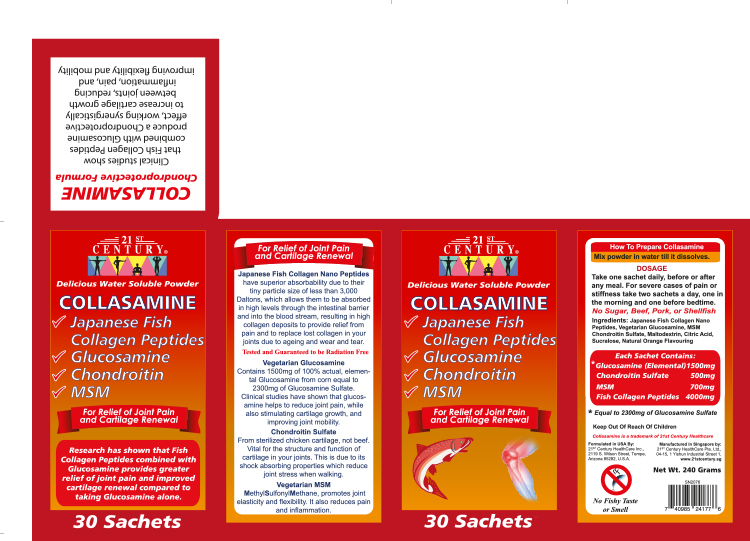 I live in Johor Bahru and I bought Collasamine in Singapore as it is not available in Malaysia. I have been on it daily for 3 months and now I am almost pain free. Most days I am totally pain free and have started long walks with no pain. My friend who had good results suggested that I try Collasamine as I had bad knee joints. Painful to walk. I tried the Glucosamine tablets from almost every brand available in Singapore but nothing helped. After 2 months on Collasamine, I can walk without pain. Hi Users. Thank you for your letters. Keep them coming to share your experiences with other sufferers of joint pains. However please understand that sometimes we need to shorten your letters and correct some minor mistakes.